This has been a long time coming. Several years ago, I attended a U2Charist worship experience at Oglethorpe Presbyterian Church in Atlanta, GA and began to brainstorm on how to coordinate a similar worship experience but correlating black musics with traditional worship formats. 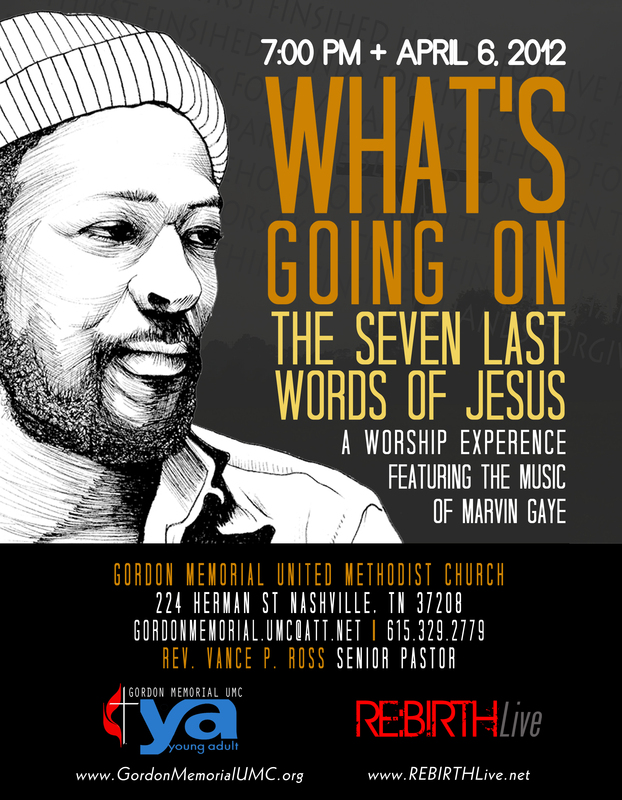 The idea emerged to correlate the traditional Good Friday Seven Last Words Service with Marvin Gaye’s What’s Going On album as a way to help uncover justice themes of the story of Jesus’ crucifixion. Many thanks to the people of Gordon Memorial United Methodist Church in Nashville, TN for hosting and helping to bring this vision to life. Shouts out to Gordon’s Senior Pastor, Rev. Vance P. Ross and my sister, Cathy Cain, event planner extraordinaire, for your trust, faith and being co-bearers of this vision. May What’s Going On be a blessing to the Nashville community and beyond. We’ve only just begun! REBIRTHLive: What are the Seven Last Words? REBIRTHLive: Why Marvin Gaye’s What’s Going On?